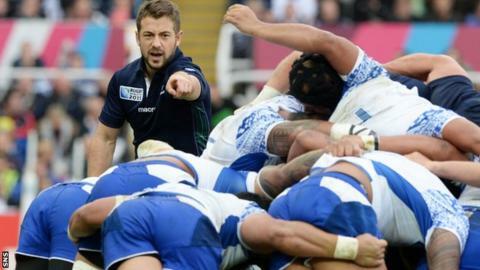 There were plenty of tactical elements to Scotland's pulsating 36-33 World Cup win over Samoa in Newcastle on Saturday. The fact that Samoa could not qualify for the quarter-finals, whatever the result, meant that they were going to want to play more expansively and give their supporters something to cheer about, despite it being a disappointing World Cup campaign. This made them dangerous - but also vulnerable. To combat this, Scotland wanted to play a slightly more set-piece orientated game and hold possession, which they initially struggled to do. The story of the first half was mainly about Samoa. They looked excited and enthused in attack, playing with width and subtlety and were throwing caution to the wind. The width they were playing with often created mismatches - backs attacking forwards - on the edges of the defensive line. Tim Nanai-Williams and Reynold Lee-lo were exceptional and regularly beat the first man. They were playing in a traditional Pacific Island style, not worrying too much about structure or exits - and this suited them. The plus side for Scotland was that they looked dangerous when they had the ball too. Samoa's defence wasn't particularly structured. They were there to put a show on in attack, but they were very keen to put the individual big hits in which can be very destructive when it comes off - but it can also create dog legs to exploit. A noticeable tactical call from Scotland was to turn down kicks at goal and kick to the corner instead. My theory on this was that they were trying to starve Samoa of the ball, to make them defend and not give the ball back until they had an extra five or seven points. It also showed a real confidence in their line-out maul and ball retention. The ironic thing was that they failed to score from the first set of drives and it was only once Scotland had Ryan Wilson sin-binned that they converted the maul into points. One of Scotland's first-half issues, and a problem area for the whole World Cup, was kick-off receipt. Samoa won back their first three kick-offs, kicking short and up the middle. Even when Scotland put a 'pod' in that target area, Samoa regained the ball. It is an area that needs to be addressed because, as I've mentioned before, it's a real momentum killer. Scotland decided to kick long with their kick-offs, pincering the Samoans deep in their 22m. I think this tactical decision was made as they knew Samoa were going to want to throw the ball around and was an area where they could build pressure. The Scots had very good numbers in their front-line chase where normally there would be a more passive chase on the edges. This suggests it was a deliberate ploy and the pressure resulted in the Tommy Seymour try. Scotland were probably fortunate to still be in the game at half-time, but they deserve credit for this and were clinical with their opportunities. Samoa seemed to self-combust just after half-time, giving away seven penalties in 15 minutes. It gave Scotland a foothold in the game, allowing them territory and possession. The match slowed down and, with that, the sting went out of the Samoan attack. Scotland continued with turning down kickable penalties into the second half, but after a few efforts, they bore no fruit. Greig Laidlaw decided enough was enough and kicked the points. There was a fairly crucial moment at 52 minutes, one that showed how important the rub of the green is. The momentum was all with Scotland and, with the score at 26-26, Samoa kicked off. Finn Russell had his kick charged down deep in his own 22m. It could have ricocheted anywhere but in this instance dropped nicely into Wilson's hands and, after a 30m break, Scotland were awarded a penalty and it was 29-26. Critical to the victory was the decision to take the scrum in front of the posts at 73 minutes, a brave call that resulted in Laidlaw's try. It's the process of the decision and previous decisions that was impressive. There were discussions, and decisions were made with clear heads, with a rationale behind them. This is the sign of a strong leadership group. The game could have slipped away, but when Scotland needed to step it up, that's what they did.